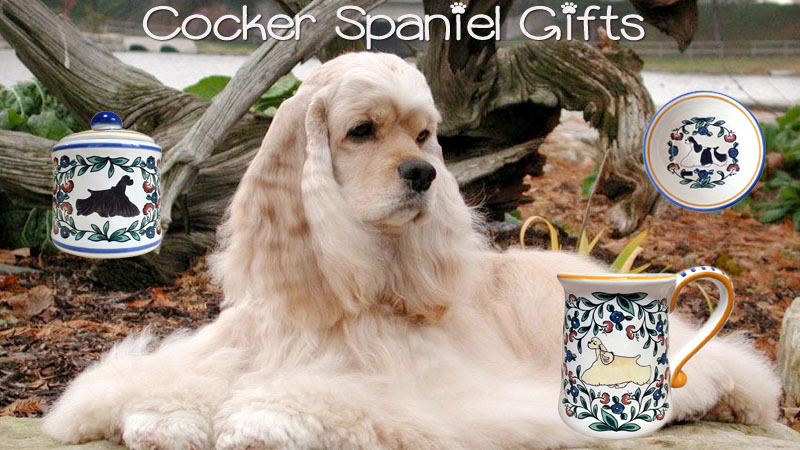 Shop our unique Cocker Spaniel Gifts. We have a variety of items including Cocker Spaniel mugs, wine stoppers, treat jars, creamers, sugar bowls, and dipping bowls. All of our items are handmade in small batches in our Eureka, CA, studio. So you can be sure that you are getting something special for the Cocker Spaniel lover in your life. Our Cocker Spaniel merchandise features a gaiting American Cocker Spaniel, surrounded by a vibrant floral pattern. These cheerful items can't help but make you smile. And, they are just as durable as they are beautiful. Our stoneware is dishwasher, oven, and microwave safe and the decoration is a permanent part of the glaze surface. We know it is important that you have a choice of different Cocker Spaniel coat colors. We have 3 standard coat colors – blonde, black, and tricolor. As the artwork and decoration are done in-house, you can also have your Cocker Spaniel merchandise customized to reflect your dog's coat color and pattern – simply choose the "custom" option on the item page and follow the instructions (a small art fee is applied to all custom orders). Currently we offer the Cocker Spaniel with show cut but if you are interested in a Cocker depicted with a puppy cut, contact us and we can add that to our design schedule. The Cocker Spaniel dog is beautiful and proud, with loads of personality – just search Cocker Spaniel on You Tube and get ready to laugh. The American Cocker Spaniel's ancestors originated in the UK as hunting dogs, bred to hunt Eureasian Woodcock – hence the term "Cocker". After being brought to America, changes were made to the breed to enable it to specialize in hunting American Woodcock, which is a similar bird, but smaller than the Eurasian Woodcock. Thus, the size and conformation differences between the American and English Cocker Spaniels. While this breed is rooted in hunting, today you find the Cocker Spaniel enjoying the status of companion animal. It is known as the "merry" cocker because it is playful, sweet, and willing to please. We hope you have found our Cocker Spaniel gifts representative of this wonderful breed.